Is it normal that debug & testing app on eclipse's AVD taking up large hard-disk space? I'm just new to android development, recently I've built two simple beginning android apps that ran on eclipse's AVD and it taken up 2GB of hard-disk space, are there any solution to normalize this circumstances? 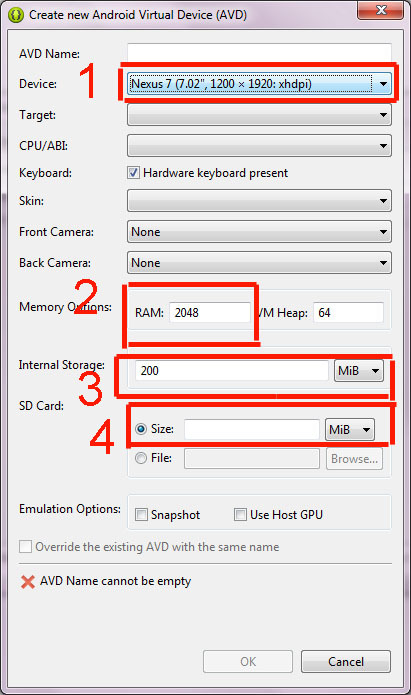 When you create virtual device for emulator you can choose sample device (#1 on pic above). For example, virtual Nexus 7 have 2048 Mb of RAM (#2) and it will take more than 2 Gb on your disk. Also, you can set Internal Storage (#3) and virtual SD Card (#4) and they will take place on disk too. For simple apps 512Mb RAM and 100Mb Internal Storage will be enough (SD Card does not need in this case). Use the real device (not emulator) to install built apps if you want to save max disk space. can I reclaim back that mistaken space? or should i lost it forever? Delete virtual devices in AVD Manager and space must be reclaimed. thank you so much, it works,.. my hard media's space has reclaimed.